Frog Lube CLP used in Afghanistan? Creates a slick (dry) surface that decreases friction – reduces carbon adherence making cleanings easier and faster. 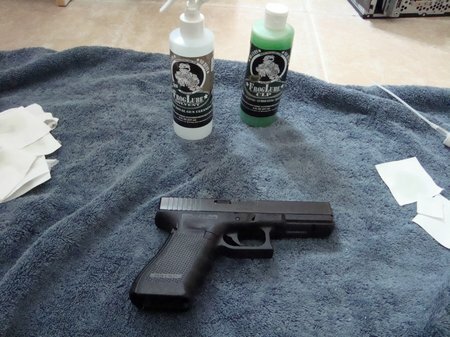 Seasons metal surfaces – the more you use Froglube CLP on your guns, the easier they will be to clean. Nylon Utility Brush and cotton tip swabs. AR-15 FrogLube Torture Test Video. Rapid fire 300+ rounds. So why is Froglube better than other CLP’s? Froglube goes on wet and penetrates into the metal and dries in a short period of time. It forms a dry barrier that lubricates and protects metal surfaces. It is not wet and slippery like most oils and lubricants. Froglube is a treatment system. It “seasons” the metal and makes subsequent cleanings faster and easier. Here is an intense gun CLP test/review involving corrosion resistance and lubrication where Froglube tops most other CLP’s….CLP Test. Here is how you apply Froglube the very first time. 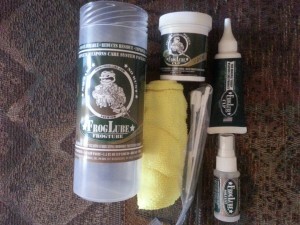 Clean your entire firearm with Froglube Solvent to remove all other lubricants, oils, sludge, dirt, cosmoline, etc. This prepares it for the application of Froglube CLP. Heat metal surfaces or apply Froglube to a warm firearm. You can do this treatment on a cold firearm but it works much better on warm or hot metal surfaces. Warm or hot metal allows it to penetrate deeper. Apply a liberal amount on all gun parts ( with a cotton ball, patch or q-tip ) and let it soak for about 15 minutes or so. I apply another light coat after this to get a deeper barrier. Then wipe with a clean dry cloth. After each shooting session, clean you firearm as you would with any other cleaner. Always apply a liberal amount of CLP to the bore. You want it to be able to penetrate the fouling and it has to be wet in order to do this. The more times you clean your gun with Froglube, the easier it will get. It builds up in the metal pores and retards fouling. You can feel the difference. The metal surface has a slick feel to it but is not wet. 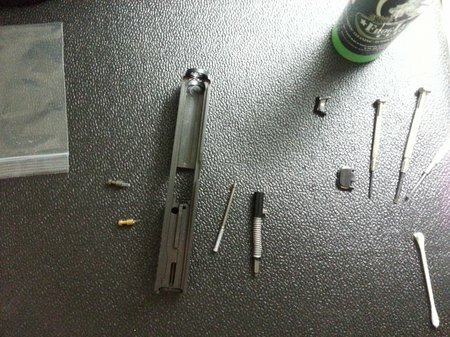 Here is my Glock 22 disassembled and ready for a good thorough cleaning. When I clean my guns like the Glock, I use a generous amount of Froglube CLP in the bore and a little less on the slide. I then scrub it and then wipe clean. When using Froglube CLP as a lubricant, apply in a very thin film for best results. In other words, apply the Froglube and then wipe the excess off with a clean cloth or cleaning patch. Too much Froglube will cause it to become sticky and attract dirt and debris. Froglube Torture Test Video – Low temperature extremes. This entry was posted in CLP and tagged froglube clp by admin. Bookmark the permalink.